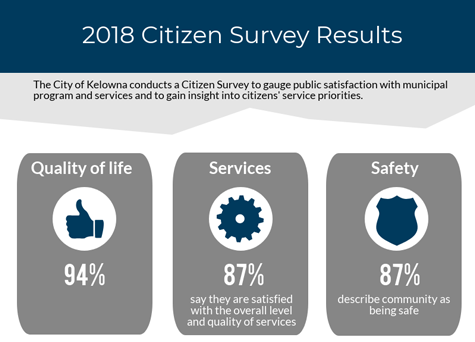 The Citizen Survey is conducted to gauge public satisfaction with municipal programs and services and to gain an insight into citizens’ service priorities. Responses are weighted by age, gender and city-wide distribution to accurately reflect Kelowna’s population. Results are benchmarked against other local governments. Insight gained by this research helps us make important decisions regarding planning, budgeting and service improvements. Kelowna continues to be seen as a safe community with a good quality of life. Citizens are satisfied with City services and believe they receive good customer service and value for their tax dollars. Top of mind issues for citizens include social issues (51%) and transportation (43%), following are second-tier issues crime (11%) and growth and development (10%). Areas of strength include fire and police services, drinking water quality for City utility customers, community cleanliness and snow removal. Traffic flow management was identified as a primary area for improvement. See what citizens declared their top investment priorities and specific areas of satisfaction by visiting the infographic for results at a glance.